Asama, Honshu's most active volcano, overlooks the resort town of Karuizawa, 140 km NW of Tokyo. 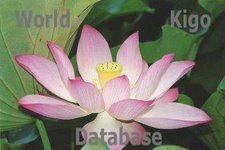 It has an historical record dating back more than 1300 years. ©　PHOTO by Richard Fiske, 1961 (Smithsonian Institution). Click HERE to see more stunning photos of Mt. Asama 浅間山. 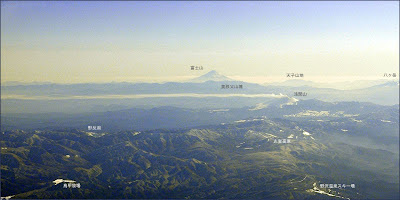 Asama is a medium-sized, andesitic composite stratovolcano in central Japan. About 10 major eruptions occurred in the last 5000 years. The latest one took place in 1783, devastated about 500 km2 and killed 1200 people. The eruption of 1783 may be taken as a typical example of the explosive activities of the Japanese volcanoes, and offers valuable information on the mitigation of volcanic disasters. 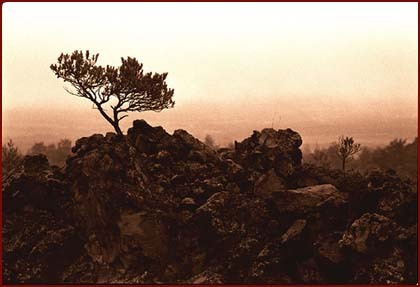 The activity started as sporadic pumice and ash ejections in May, 1783. 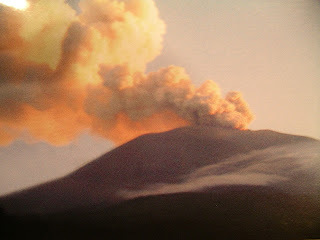 After late July, the eruption became continuous with increasing intensity up to early August. A huge plinian column blackened out the eastern sky and heavy thunder and lightning, and powerful air waves shaking the houses, made the inhabitants panic. Less than half the total volume (0.3 km3) of pumice and ash fell before August 3 and more than half was erupted during the two-day period leading to the climactic explosion in the morning of August 5. In the afternoon of August 4, 0.1 km3 of hot pyroclastic materials overflowed the northern crater rim to cascade down the northern slope as scoria flows. They contained abundant cabbage-shaped essential blocks very similar to bread-crust bombs. The flow was a sluggish, intermediate-type pyroclastic flow (Agatsuma flow), but the emplacement temperature was exceptionally high and the deposit was welded down to a 20 cm thickness at distal ends. It devastated about 18 km2 of dense forest where many tree moulds were formed as the deposit cooled around the standing trees. At about 10 o'clock in the morning of August 5, a gigantic explosion occurred at the summit crater, to be heard more than 300 km away. Huge hot lava blocks shot into the air and rained over the steep northern flank to form a high-speed avalanche. According to old documents, four villages, including Kambara on the northern slopes, were immediately wiped out by the flow; on reaching the gorge of the Agatsuma river, it caused a great flood. The head of the flood, standing more than 10 m high, forced through downstream, destroying more than 1200 houses and killing hundreds of people. The flow apparently started as a mixture of high-temperature, large blocks and air, but it soon dumped most of the blocks in its upper course (less than 8 km from the vent). The blocks were up to 35 m across and show a bread-crust structure; because of their heavy mass and great momentum, the blocks ploughed the earth's surface to a maximum depth of 40 m.
The excavated earth materials were accelerated by the kinetic energy of the blocks and formed an avalanche. which continued to flow further downstream. When the flow reached Kambara village, about 13 km north of the crater, more than 90% of it consisted of the foreign materials mobilized from the lower slopes, and less than 5% of high-temperature, essential materials directly derived from the vent. Out of the 560 inhabitants of Kambara village, only 93 survived. A low ridge borders the western margin of the village. At the top is a small shrine with stone steps leading to it. It is recorded that those who had time to climb the steps to the top survived, but those who did not perished. Recent excavation revealed that the stone steps continued about 5 m below the present surface and the remains of two of the victims were found at the foot of the steps. The total number of deaths amounted to more than 1200, including those caused by the flood. The avalanche is remarkably uniform in thickness, about 2.5 m on average, and consists of large blocks and homogeneous matrix facies, indicating that the fine part was homogenized by strong turbulence. The contrast between the slow-moving Agatsuma pyroclastic flow erupted the day before, and the highly destructive, high-speed and multi-component Kambara flow is remarkable. The mechanism of the generation of the Kambara flow is not yet clear, but the generation and ejection of about 107 m3 of dense but hot lava blocks apparently gave rise to a high energy avalanche capable of scraping the surface materials of the lower slopes. Immediately after the climactic explosion, 0.17 km3 of lava cascaded down the northern slope to form a 5.5-km-long lava flow called Oni-Oshidashi. About 200 bulk rock analyses taken from the air-fall pumice, Agatsuma deposit and Oni-Oshidashi lava flow, strongly suggest that the magma prior to eruption was slightly zoned: i.e. slightly more felsic magma erupted in the early stages and more mafic magma came out of the vent in the later stages. However, the sequence was repeated after the Kambara flow eruption and the earliest phase of Oni-Oshidashi was as felsic as the earliest phase of the Agatsuma flow. This may indicate that the output of magma was interrupted for some time just before the climactic explosion that produced the Kambara flow. Those are not all clouds at the top of the mountain. He lived on Mount Asama as a 神人 kind of Human Deity since the beginning of History. 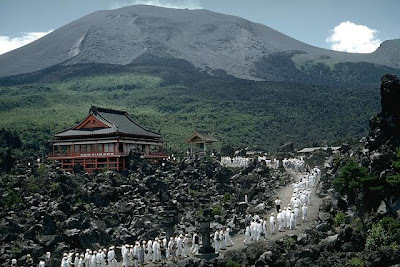 Mount Asama is a volcano in Issa's home province of Shinano, active during the poet's lifetime. The eruption of 1783, when Issa was twenty-one years old and living in Edo (today's Tokyo), killed 1,151 people. view of Mount Asama in the foreground and Mount Fuji in the background. The "again" (mata) is the key. The volcanic smoke is so all-pervasive, it shows up everywhere, even at the gushing spring. Dirty smoke and pure water create an interesting juxtaposition. The night before the annual Boy's Festival (fifth day, Fifth Month), eaves of houses were thatched with grafts of blooming irises. In this haiku, the smoke appears so thick, it looks as if it--not houses--is being thatched. 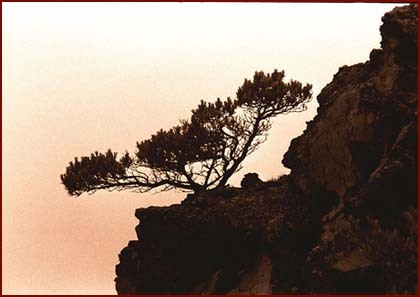 Read more ASAMA haiku here ! Shinano Province (信濃国, Shinano no kuni) is one of the old provinces of Japan that is now present day Nagano Prefecture. Its abbreviation is Shinshū (信州). In the Sengoku Period, Shinano Province was often split among several fiefs and several other castle towns developed, including Komoro, Ina, and Ueda. Shinano was one of the major centers of Takeda Shingen's power during his wars with Uesugi Kenshin and others.
. Iida Ryuta (Iida Ryouta) 飯田龍太 . This summer hokku was written in the 5th month (June) in 1813, the year Issa finally received half of his father's property in his hometown according to an agreement reached on 1/26 of that year. His inheritance included half of his father's house, which he was not able to enter until 3/1, no doubt because the house had to be radically rearranged. Even after entering his house, however, Issa continued to travel constantly to the houses of his students, patrons, and relatives in nearby villages and towns. He was on the road for the great majority of his time in 1813 and used his new house mainly as a home base for his constant travels. Judging from Issa's diary, in the 5th month of 1813 he stayed overnight in his house only five times. What the hokku literally says is, "As for my house, the moon and pure water of Shinano!" 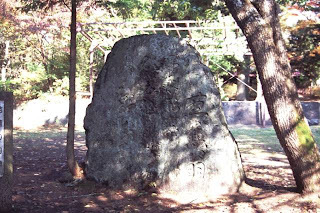 The hokku placed near this hokku in Issa's diary are about nature or are evocations of things Issa seems to have seen on his travels, so I take Issa to be declaring that his real house or spiritual home is not any one physical house but a dwelling made of the clear moonlight and the pure springs and streams in his native Shinano province. thank you for good information about Mt,Asama that issa had made many haiku. It is getting clear by reading your resarh. 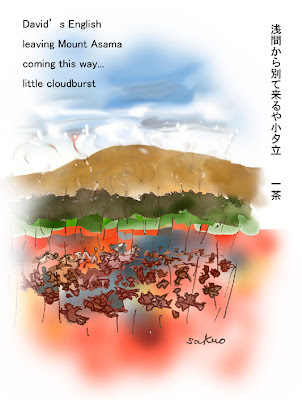 by Issa, thank you Gabi san for many referring to Issa's haiku. I am appreciated if you find it. In another haiku in which Issa uses the phrase, "sandal road" (zo^ri michi), Shinji Ogawa believes that this refers to footprints in snow. That particular haiku is situated in the New Year's season, and so it is natural to assume a snowy scene, especially in the mountains of Issa's home province of Shinano (today's Nagano Prefecture). I believe that the present haiku, since it takes place in spring ("butterfly" = spring), refers to footprints that have beaten a track in the dirt of a road.